Three conferences, flights to San Francisco, Jersey City, and Boston – November is a crazy but exciting month! First, my collaborator Adriana Meza Soria (2nd year Software Engineering Ph.D. student) and I won the second place at the Student Design Challenge at the 2018 American Medical Informatics Association (AMIA) Annual Symposium! We got featured at the ICS School Newsletter (read more about the project in this post). Second, on the day after the AMIA conference ends, on November 8th, I passed my comprehensive exam (no revision!!). Third and fourth, I attended the first accessible voice workshop at CSCW, and presented my interview study (short talk #4599) at ASHA 2018. It’s impossible to blog about all of them, so let me share the AMIA design challenge, which will become my dissertation project. I have to say that the story behind this experience has been an exciting journey. I initially found out about the AMIA Student Design Challenge in Winter 2018. 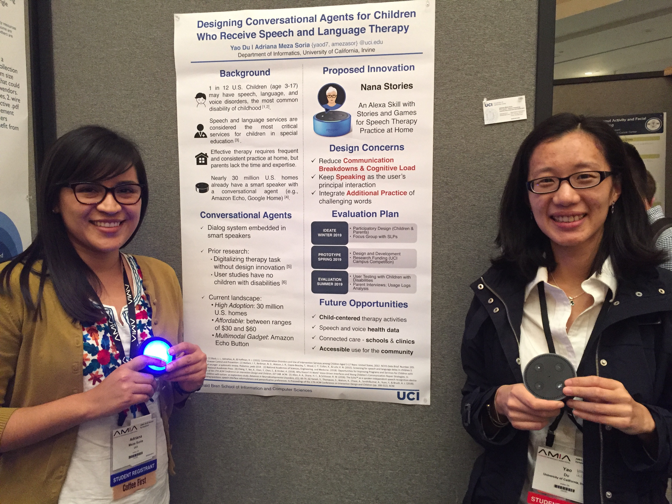 During that time, I’ve also been learning from other doctoral students about conversational agents (the voice-only dialog systems embedded in personal technologies and devices such as Amazon Echo and Google Home) and its potential to help children with communication impairments (which originated from my clinical background as a speech language pathologist). 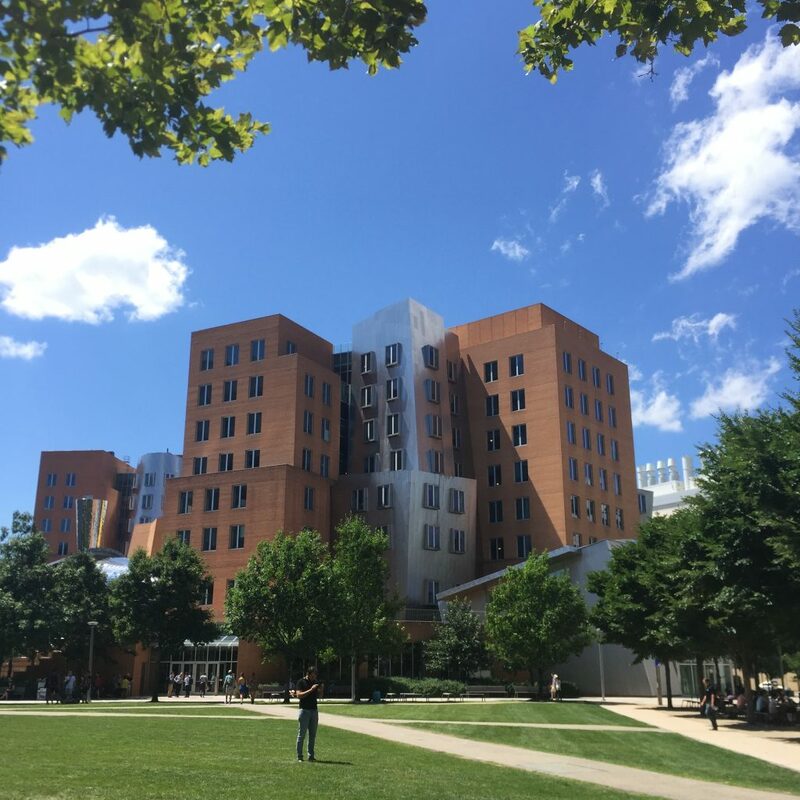 I have attempted to establish several potential collaborations with graduate students across Informatics, Education, and Software Engineering to investigate some shared interests in this place. While taking a graduate writing class and peer- reviewing each other’s writing, I found my collaborator Adriana Meza Soria, a graduate student in software engineering. I realized her interests in software design knowledge to be fascinating for me. Collaboratively, in Spring 2018, we attended some local workshops by Amazon on how to develop Alexa Skills (the conversational agent for Amazon Echo) and integrate new gadgets such as Echo Button to design multimodal interaction. This leads to our final AMIA proposal submission, which gained surprisingly positive responses from the judges across both fields of medical informatics and human-computer interaction during the two tiers selection process. 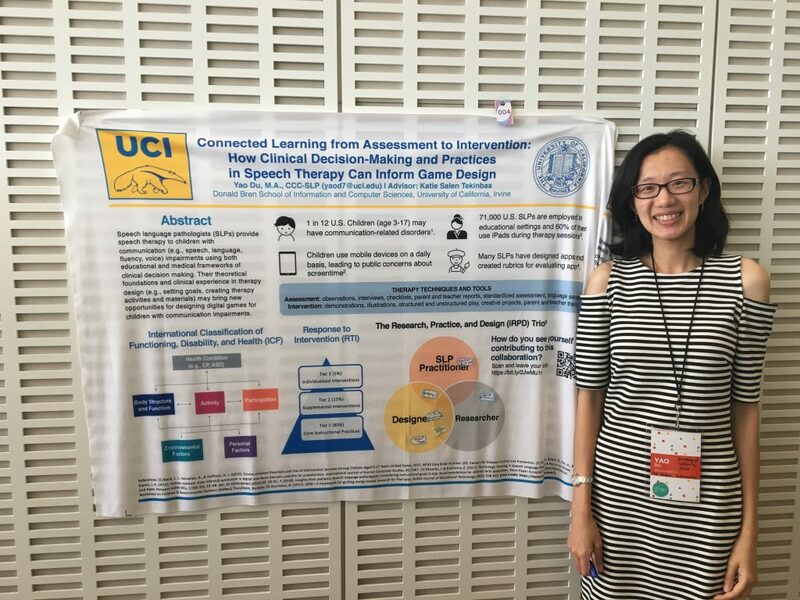 We are selected for both a poster presentation and a final oral presentation to compete for the top three places, along with two other teams from Columbia University (who developed a hybrid Alexa Skill and Facebook Messenger app that calculates and analyze nutritional consumption for diabetes intervention) and UC San Diego (who developed a home-based imaging technology for monitoring macular degeneration – a leading cause for vision loss – in elderly individuals). It is worth mentioning that we are the only team who designed for children with disabilities as a vulnerable population that needs a collaborative care approach rather than adults who are capable of managing their health. At our poster session, we received great attraction from multiple individuals. A professor from the University of Washington emailed us before our attendance, as her students in nursing have requested to interview with us regarding our design. Several physicians and informaticists from Stanford Children’s Hospital, UC Davis, University of Pittsburgh, and Mayo Clinic not only gave us great feedback on issues such as interoperability between multiple contexts and data sharing and privacy but also shared their own user experience and perspectives on these voice technologies as parents and health providers. At the Poster Session: Adriana Meza Soria (2nd year Software Engineering Ph.D. student) and Yao Du (3rd year Informatics Ph.D. student) of University of California Irvine. Photo Credit: Uba Backonja, PhD, MS-RN, Adjunct Assistant Professor, University of Washington School of Medicine &amp; School of Nursing. I think winning the second place is beyond our anticipation, as our design is only in its initial conceptual design phase, compared to the first-place team from Columbia University who has been investigating their plan since 2017 and has been previously selected as the top 5 finalists of Alexa Diabetes Challenge. This Columbia team, led by Ph.D. student Elliot G. Mitchell, is a returning champion who has won the AMIA Student Design Challenge 2017. The team has a well-established collaboration with Columbia Medical School, initial data from a pilot study, and a more sophisticated implementation plan. Reflecting on how the first-place team frame their research and address their dissemination plan, I’ve learned how to project the future work of my design to address the feedback from the AMIA community – which put a heavy emphasis on clinical application and research efficacy (in addition to innovation). Additionally, this experience highlights the enormous potential of resources that I have not been able to leverage at UC Irvine, as we have several researchers who are active in the AMIA community, as well as our UCI Medical Center and affiliated Children’s Hospital of Orange County (CHOC). Obtaining early feedback on this design before I formulate a concrete dissertation topic indeed allows me to train myself as a critical thinker who designs and conducts research that integrates multi-disciplinary perspectives. I plan to continue the design and development of this project in the upcoming years, through obtaining an IRB protocol, connecting with these stakeholders of interests, and ongoing design and development of this project as a potential dissertation topic. I am extremely grateful for my collaborator Adriana, our doctoral peers in Informatics and Education, and our advisors (Katie Salen Tekinbas and André van der Hoek) for their support during this wonderful journey. I highly recommend this competition to future students in ICS and I am more than happy to support more UCI teams in these competitions. Here’s a picture of all the three finalist teams. WOMAN POWER! Student Design Challenge teams. 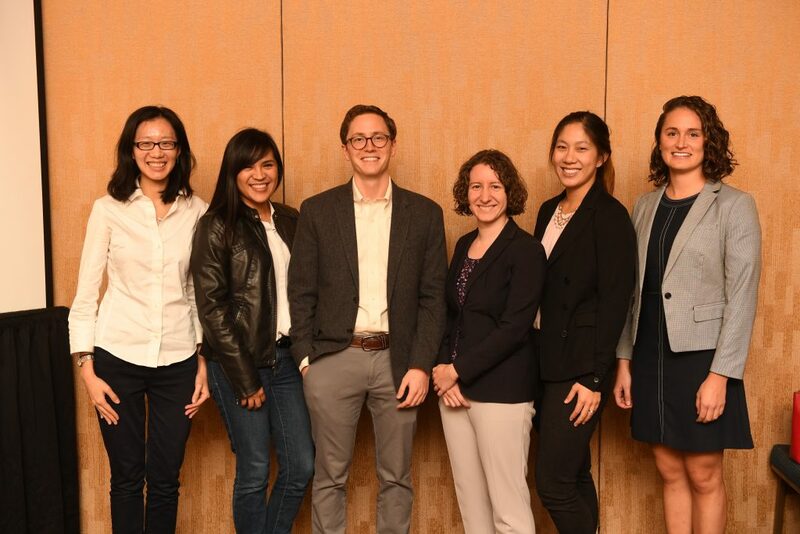 From left to right: Yao Du and Adriana Meza Soria of University of California Irvine; Elliott Mitchell and Lisa Grossman of Columbia University; Sally Baxter and Helena Gali of University of California San Diego. Photo Credit: AMIA Communication Team. 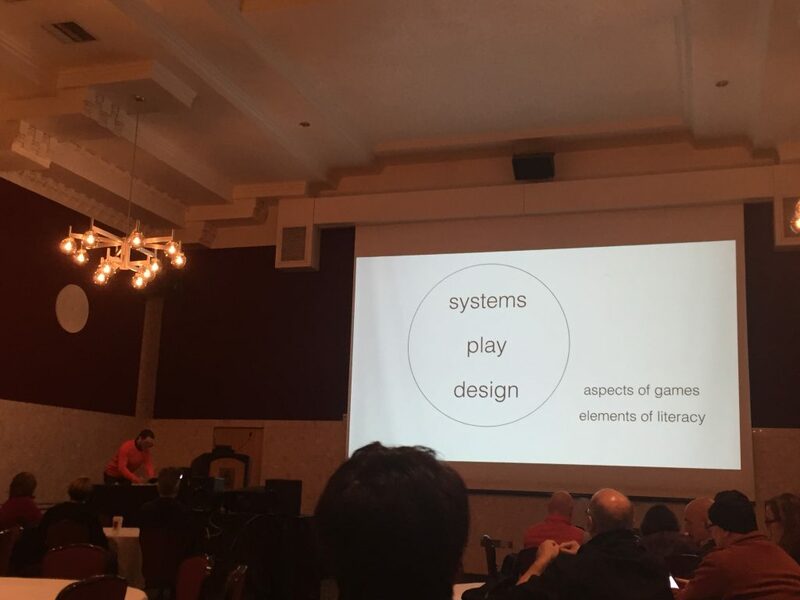 Attending the International Conference for Meaningful Play 2018 in East Lansing, Michigan (October 10-13, 2018) significantly helped me towards achieving three major career goals: presenting and obtaining feedback for my scholarly research, networking with the game design and research community, and establishing both short-term and long-term agenda for research and career advancement. I have taken full advantage of this conference, and all of these learning outcomes are critical to my ongoing career development as a doctoral student and a future academic researcher. Liberian at U of Michigan: This shift in online searches are moving to voice command, how does it impact the future of game design, library catalogs, and non-mainstream interfaces? What are your thoughts on this? My response: my colleague in grad school is now working as an SLP in a deaf-blind school and she has already adopted the smart speaker – Amazon Echo – to help middle schoolers with minimal verbal skills to create shopping lists. As a researcher, I found myself always falling behind how actual users are adopting and repurposing these technologies. My tentative dissertation project idea is indeed to investigate the clinical implication of therapy games using home-based voice technology tools. Grad student in Michigan Tech U: I am wondering about parents or babysitters who are working with the children (my brother has autism and my parents can tell you many good insights about him). Are you considering parents and their input and getting their mental model of how they interact with children on a daily basis? My response: The reason why I didn’t even start looking at parents yet because they are one user group that grows organically during my research. Two of the app developers I interviewed are indeed parents with children who have disabilities. Therapists are now designing apps because of their terrible user experience with existing technology; parents are becoming app designers and developers because they want to help their children. The “app designer/developer” stakeholder group that I interviewed has a very blurry definition and individuals hold multiple roles in this ecosystem. There is also more research related to how parents (rather than therapists) are using technologies with these children, for my research, I want not only to focus on SLP practices but also to understand the larger landscape: who’s voice is being left out? In addition to the wonderful feedback that definitely will inform me for the next phase of my research project, I also learned new research methodologies and grew my research network. The other paper presented shared how using cognitive task analysis (with 4-5 people) rather than semi-structured interviews can become an effective methodology to investigate clinicians’ gameplay strategies, which can lead to a potential follow-up mixed method study. A Michigan journalist who owns an online special education technology website (http://specialedtech.net/) invited me to write a blog about my presentation, which serves as a great opportunity to educate the public about my research outcome. 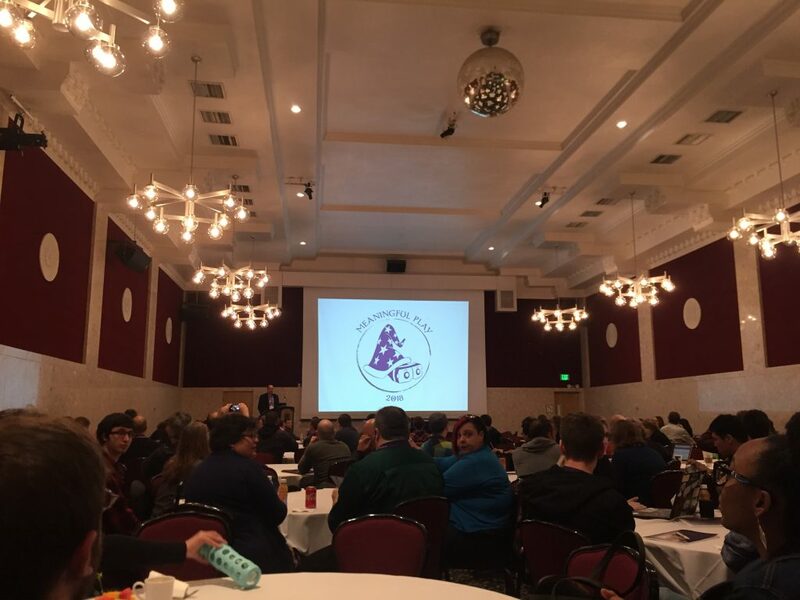 I am extremely grateful for the opportunity to attend this conference to connect with practitioners and researchers who are all passionate about creating better technology tools for children with disabilities. Many of these individuals are deeply connected to the Michigan game design and research communities that I would not have met without the generous support from the DECADES Student Travel Grant. Instead of using machine learning for prediction (take resources from poor people to powerful people), we need to understand and expose the causal relationship of things going on in the society, have a conversation with communities and allow policymakers to connect with families, because policies are products of professionals not communities. Data must be prepared for cultural movements. 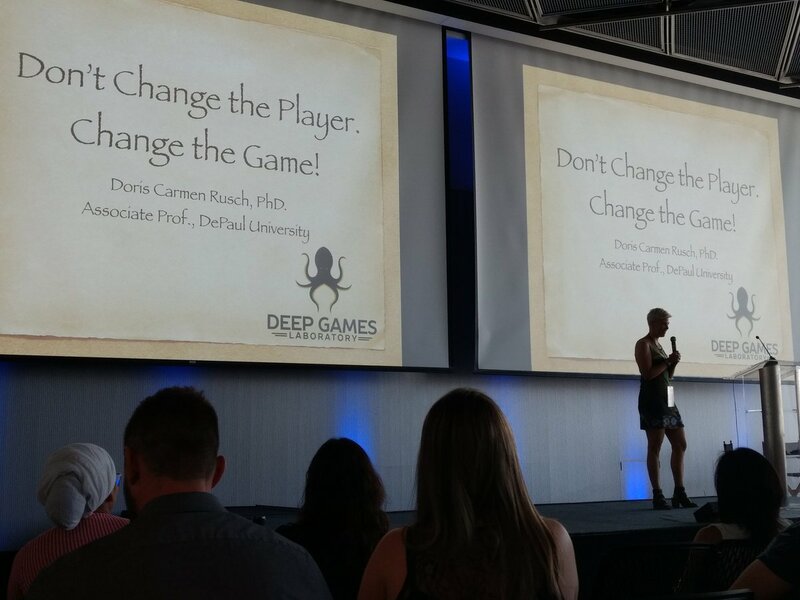 Last week, I had a great time at Connected Learning Summit in Boston. This is a community that cares about the same course of actions and have set great examples ahead of me through their research projects and design work. Listening and speaking to this community truly helped me clearing my mind about my comps, so I was able to restructure my outline on my plane home (and totally did not get affected by the jetlag). Summer in Boston is really charming and even the humidity reminds me a lot of my hometown in China. MIT is a charming campus, and full of vibrant energy and ideas. I also got to meet some really wonderful game designers and researchers besides the MIT folks, especially people from RIT interactive games and media and practitioners who work with disabilities.Just a side note: I really love Justin Reich (who runs the Teacher Practice Spaces – Teaching Systems Lab), not only because he’s so well-spoken during presentation as in his writing, but his teaching system lab sets such a great exemplar to bridge the research-practice gap. Though I wish there’s a larger group of practitioners/designers/researchers all together in a Panel, maybe this is something I can help to organize next year either as a panel or as a special interest group, since it’s at UCI in October and I should have advanced by then. There’s even an idea to offer doc students/junior researchers a mentorship or consortium event, which I think is also a fabulous idea, especially for communities like CLS that’s really diverse. My first poster experience (and first time printing on fabric too) went well, about 15+ people (from Asia, Europe, and US) stopped by at my poster for extended 1:1 conversation and used a small sticky to label themselves on my poster, and they love the interactivity. Designers constituted a majority of the group, and it’s not surprising that many of them hold dual roles. Two of them are parents who have children in speech therapy, one program officer for school, which definitely helpedme broaden my circles of categories. During short interaction like this, it seems definitely more effective to have direct drawing/posting interaction than using the Bar Code (which appears to be a better option to have on a handout, as I saw from other presenters). Anyhow, it’s a really interesting means of presentation. Though I miss having the flexibility to go around different booth because I have to stay with my poster to present, I got to shape my elevator pitch more than 15 times, and now I’m learning new things that I had not covered from my interaction with other people. My “aha” moment came after participating in the workshop “The Secret Process for Creating Games that Matter” (by Jesse Schell, author of The Art of Game Design, and Barbara Chamberlin, head of the Learning Games Lab at New Mexico State University), learning about how to walk through the game design process and create a game that encourage healthy behavioral change to reduce plastic waste. This process is very similar to how a clinician perform an assessment to determine impairment and treatment goals, create therapy activities, and then engage the client to participate in activities to improve communication skills. However, designing a game-like activity to change behaviors outside the context of speech therapy is very tricky, especially when considering the complex sociocultural factors associated with a specific behavioral change. 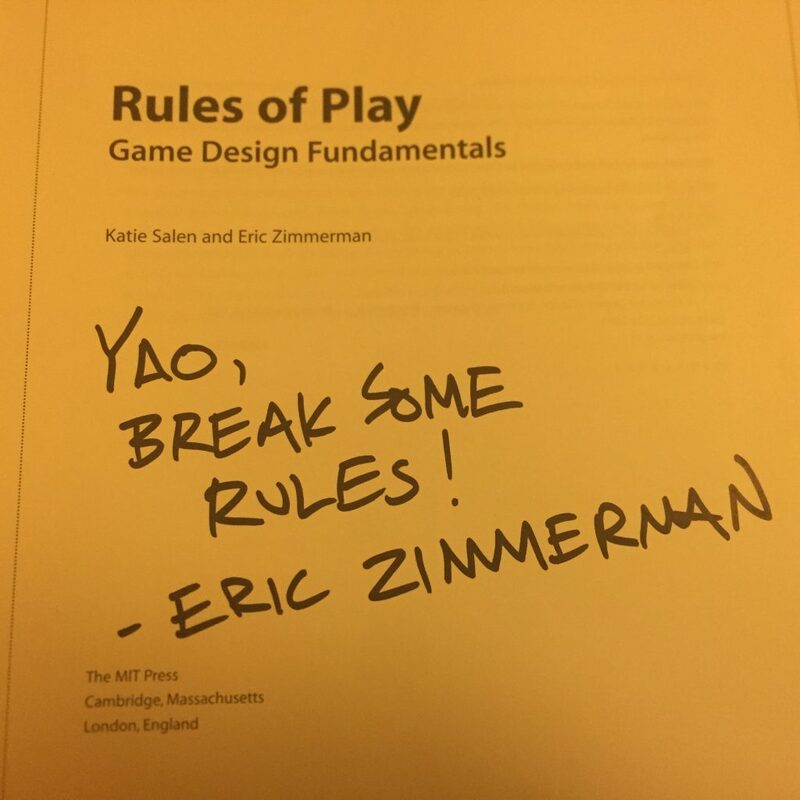 Researchers and practitioners are interrogating game design from both sides of the moon; this is why CLS is an amazing community. I can’t wait for it to return to UC Irvine next year! My first experience at IDC 2018 and my first trip to Europe is a blast! I have learned so much and also feel cognitively/mentally exhausted from trying to absorb all the topics/talks (despite knowing that this is probably not the best way to spend my energy but just can’t help)! I also got to meet a lot of professors working in this space from all over the Europe and even in Australia. There are three researchers making apps related to speech therapy/children with disabilities, and I’ve officially recruited them for my research study. There’s also an increased interest in voice-based interaction. 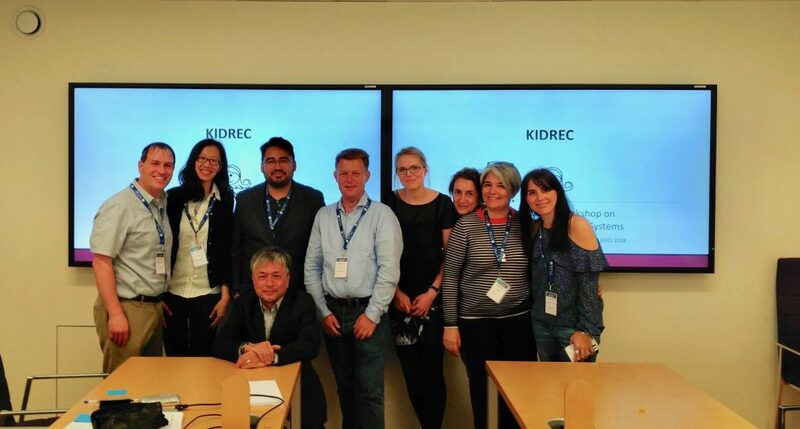 I am glad that I actually started my first day at IDC with a pre-conference KidRec Workshop (with international researchers from Italy, Netherland, Switzerland,UK, and USA). We got so many things (e.g., critical evaluation of existing landscape, collaboration for publication to potential venues, comparing industry vs. academia needs); it’s such a enjoyable and loving group. One of the workshop organizer, Dr. Jerry Alan Fails, will be the host organizing IDC 2019 in Boise, Idaho. I should definitely consider submitting because the theme is “Living Healthy”. I have downloaded all relevant proceedings and plan to spend more time to reflect on some of the paper sessions/talks that I resonate with. This is a particular good exercise for me as (1) a mean to re-process all my learning holistically, (2) an appreciation for the kind travel sponsorship from my advisor, and (3) a way to help contributing to institutional knowledge for future perspective doctoral students who may also attend IDC in the years to come. My biggest “aha” moment is recognizing my contribution to Recommendation Systems by sharing ongoing practice experiences from speech language pathologists and elaborate on how these health professionals recommend educational and clinically informed contents when they use multimedia with children with disabilities in the context of speech therapy. Another contribution is how to build upon what my advisor has trained in terms of “system thinking” and its implication to the research, practitioner, and designer collaboration framework, proposed by Natalia Kucirkova. For instance, is it possible to use a metaphor of human anatomy to illustrate the relationship between different stakeholders? Does children = heart of what we are designing for, designer = hands that allow design work to happen, and researchers = brains that empower creativity and innovation? So, what did everyone learn from the KidRec Workshop? What is recommendation system? What is relevant? Outcome: Where are we as a community? Why this community matters? What happens next? How do we reach out to others?